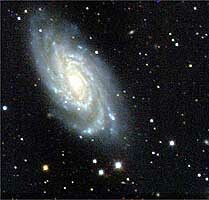 The Sloan Digital Sky Survey began operating on June 8, 1998. Since that time, SDSS scientists have been hard at work analyzing data and drawing conclusions. This page describes seven of the SDSS's most important discoveries so far. Many more discoveries are still waiting in the data. Asteroids are small objects made of rock or metal that orbit the Sun. Most asteroids are found between the orbits of Mars and Jupiter, about 200 to 400 million miles from the Sun. They orbit the sun quickly enough, and close enough to the Earth, that they move during the five minutes it takes for the SDSS to scan a piece of sky. 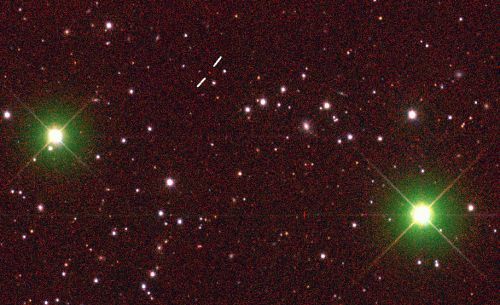 Very fast asteroids appear as colored streaks in SDSS images; slower asteroids appear as two or three colored dots close together. You can look for asteroids yourself in the Asteroids Project. In 2001, a team of SDSS scientists led by Zeljko Ivezic of Princeton used the imaging data pipeline to find over 10,000 asteroids in SDSS data. The team studied the asteroids' brightnesses to learn about their sizes, and the asteroids' colors to learn about their compositions. The team drew two important conclusions from this study. First, the scientists concluded that the asteroid belt probably contains about 500,000 asteroids - only 25% as many as astronomers previously thought. Second, the SDSS scientists confirmed previous suggestions that the asteroid belt is actually two belts: an inner belt of rocky asteroids and an outer belt of icy asteroids. The scientists showed that asteroids can be classified into these two belts based only on their colors, a process significantly faster than other methods. The SDSS will continue to be a rich resource for scientists - the SDSS team estimates that the survey will eventually discover 100,000 asteroids! 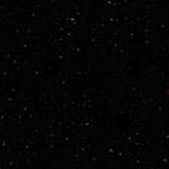 Brown dwarfs are missing links in the story of the universe: objects too big to be planets but too small to be stars. For forty years, scientists have known that they must exist, but since they do not emit light from nuclear reactions, they are very dim and hard to see. Brown dwarfs come in two types. Class L dwarfs have about 50 to 80 times the mass of Jupiter, while class T dwarfs have about 20 to 50 times the mass of Jupiter. Class T dwarfs are cooler and fainter than class L dwarfs. By the time the SDSS began in 1998, ten years of searching had produced a handful of class L brown dwarfs and only one class T brown dwarf. 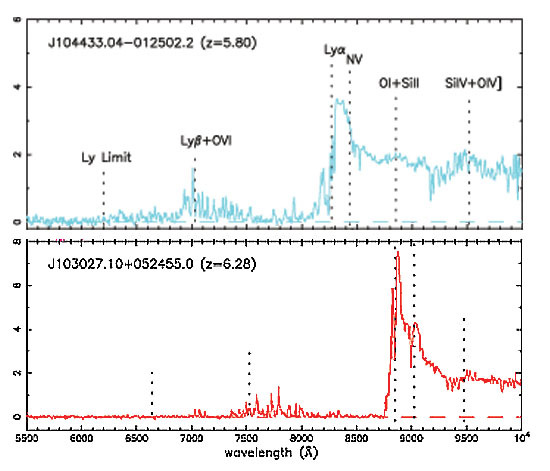 But in 1999, SDSS astronomers Xiaohui Fan and Michael Strauss of Princeton found a faint red object in the SDSS data. When they looked at its spectrum, they found a line for methane - a clear signal of a class T dwarf. Two weeks later, Zlatan Tsvetanov and Wei Zheng of the Johns Hopkins University found another class T dwarf in the SDSS data. Astronomers are now studying both objects closely - although scientists now know for sure that brown dwarfs exist, they still know very little about them. All galaxies, including our own Milky Way, have thin spherical "halos" of stars that surround them. Astronomers have two theories about where these halos came from. Either the halo formed first, and the galaxy condensed out of them, or the halo formed later, built up from smaller galaxies that crashed into the main galaxy. SDSS astronomers have been trying to decide between the two theories. A team led by Heidi Newberg of Rensselaer Polytechnic Institute and Brian Yanny of Fermilab carefully mapped a large part of the Milky Way's halo. They found five sections where the halo was unusually thick. They made H-R diagrams of the stars in these thick areas - graphs that show how bright different types of stars shine (you can make your own diagrams in the H-R Diagram Project.) The diagrams they made looked similar to diagrams for a small galaxy called the Sagittarius Dwarf Galaxy, which orbits the Milky Way. This discovery suggests that the stars in these five thick areas of the Milky Way's halo were pulled out of the Sagittarius Dwarf by the Milky Way's gravity. These areas lend support to the idea that galactic halos are built up over time as smaller galaxies crash into larger ones. For about 25 years, astronomers have known that what we see is not all there is. In the mid-1970s, Vera Rubin, an astronomer at the Carnegie Institute of Washington, studied the rotation of galaxies and realized that they must contain much more matter than we could see. Further studies showed that about 90% of the matter in the universe does not emit light - it is "dark matter." Although scientists knew then that dark matter must exist, they still did not know what it was or where it was hiding. This nearby galaxy (NGC 6070) bends light from distant galaxies behind it. In 1999, a team of SDSS astronomers led by Phillippe Fischer and Timothy McKay of the University of Michigan set out to find dark matter in nearby galaxies. They used a technique called "gravitational lensing" predicted by Einstein's General Theory of Relativity. Massive objects like galaxies bend light rays that travel near them, just as a glass lens does. So when you look at a distant galaxy behind a nearby galaxy, light from the distant galaxy will be bent, and the distant galaxy will look smeared out. However, the amount of smearing is very small, less than 1% of the width of the galaxy. Since galaxies look fuzzy anyway, astronomers have a hard time telling how much of the smearing is due to gravitational lensing by the nearby galaxy. Fischer and McKay added up the smeared images of distant galaxies around 30,000 nearby galaxies, guessing that the random variations in galaxy shape would cancel out, but the effect of gravitational lensing would add together. Then, they used a computer program to find what mass distribution in the nearby galaxies would be required to generate the observed lensing. They found that the galaxies were twice as big as anyone had previously thought. In fact, the Milky Way's dark matter probably stretches out so far that it touches the dark matter of the Andromeda Galaxy, 2 million light-years (18,921,600,000,000,000,000 kilometers) away! So now astronomers know that much of the universe's dark matter forms a part of galaxies like our own. But they still do not know what dark matter is. The most distant object ever seen is the faint red dot in the center of this picture. Quasars, galaxies with very active centers, are the most distant objects in the universe. A typical quasar is the size of our Solar System, but produces as much energy as an entire galaxy. 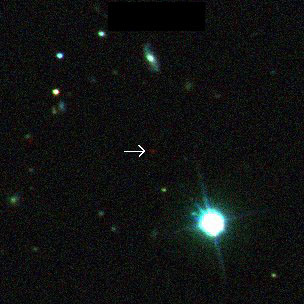 Because quasars are so bright, we can see them on Earth even though they are very far away. Because light travels at a finite speed of about 300,000 kilometers per second, it takes light a long time to get from quasars to us. Because of this time delay, when we see a quasar, we are looking at it as it was billions of years ago. Therefore, studying quasars can tell us many things about the early universe. The SDSS was specially designed to find quasars. In fact, since 1998, the SDSS has found 26 of the 30 most distant quasars ever seen. In 2000, a team of SDSS scientists found the most distant quasar yet - a quasar that emitted its light when the universe was less than one-tenth of its current age. SDSS astronomers have found over 100,000 quasars - ten times as many as were known before the survey. As soon as astronomers found distant quasars, they began to think of ways they could use them to understand the early universe. In 1965, Jim Gunn (who went on to work for SDSS) and Bruce Peterson of Caltech predicted that distant quasars should show evidence of the end of the cosmic dark ages. But until recently, no one had ever seen an object distant enough to check their prediction. About a million years after the big bang, the universe was full of a thick gas of hydrogen atoms. Hydrogen atoms absorb ultraviolet light well, so any light traveling through early the universe was quickly absorbed by a hydrogen atom. The universe was dark. Over time, the gas clumped together to form the first stars, which began to emit light - but this light too was quickly absorbed. Eventually, the stars became bright enough that their light had enough energy to break the hydrogen atoms into protons and electrons. After this happened, light could pass freely through the universe. The cosmic dark age was over. Gunn and Peterson realized that even a small amount of remaining hydrogen atoms - as little as 1 remaining atom for every 100,000 broken - should have enough of an effect to be noticed in the spectrum of a distant object. Gunn and Peterson predicted that astronomers should see a "trough" in the ultraviolet part of an object's spectrum - less light than expected - because of the remaining hydrogen atoms. This effect was called the "Gunn-Peterson trough," and astronomers began to look for it. 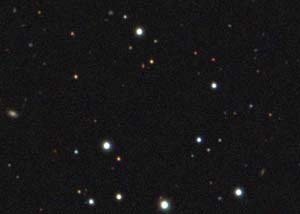 In the summer of 2001, Robert Becker from the Lawrence Livermore National Laboratory in California led a team of astronomers that examined the spectrum of the distant quasar shown above. 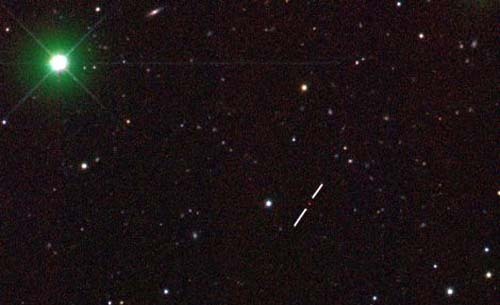 Becker's team found an unmistakable Gunn-Peterson trough in the quasar's spectrum. Because the quasar was so far away, its trough was shifted from the ultraviolet into the infrared. The team's discovery ended a nearly 40-year search. SDSS astronomers will now look for Gunn-Peterson troughs in other distant quasars to try to gain a better understanding of the effect. The spectrum of the very distant quasar (bottom spectrum) compared to the spectrum of a closer quasar (top spectrum). Note the height of the spectral lines on the left side of the spectrum. The bottom image shows the first Gunn-Peterson trough ever discovered. The primary question that SDSS was designed to answer is: what is the large-scale structure of the universe? Scientists know that stars make up galaxies, galaxies make up clusters, and clusters make up superclusters. But do superclusters make up super-superclusters? At what point does the clustering stop? 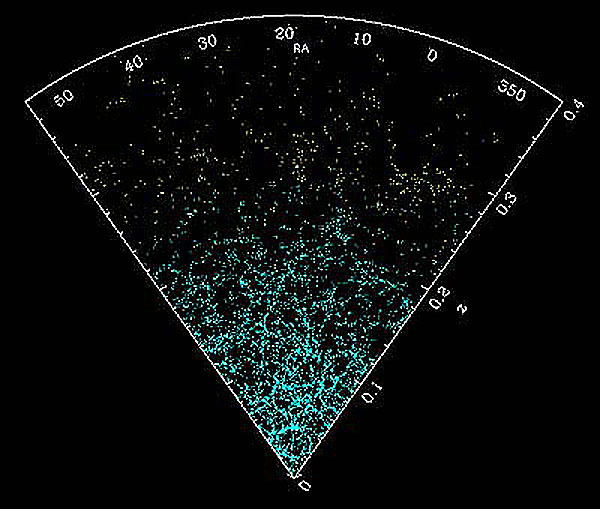 The graph shows the distribution of galaxies in a wedge-shaped section of the universe seen by the SDSS. RA stands for "right ascension," a measure of position in the sky, and z stands for redshift, which is related to distance from Earth. Each dot in the graph is one galaxy. The graph thins out at greater redshifts because galaxies farther away are harder to see. The graph shows that galaxies organize into long, narrow walls with open spaces between. The universe looks a little like a mass of soap bubbles in a kitchen sink. Now that astronomers have this map, they can start to analyze it in detail. They are now looking at the spacing between the strips of galaxies. Different theories about the history of the universe predict different amounts of spacing, or "characteristic wavelengths." By carefully studying the characteristic wavelengths in the map the SDSS makes, astronomers can decide between different theories. That work will probably take many years. The SDSS's public website keeps a News page that lists SDSS's press releases and collects links to articles about SDSS in the popular press. Click the link below to go to the SDSS News site. Most of the research described here has been described in detail in papers published in scientific journals. Click here for a list of publications.